The beach is just behind The Ilikai...plus a beautiful swimming lagoon. Waikkiki Ilikai Condo - Inside The Ilikai Hotel - Resort atmosphere. $100/nt for 5 nights, $125/nt for 4 nights, $150/nt for 3 nights of less plus tax, a one time cleaning free of $150, insurance of $59 plus VRBO fees. Regular rate is $250/nt +. $175/nt for 5 nights, $200/nt for 4 nights, $225/nt for 3 nights of less plus tax, a one time cleaning free of $150, insurance of $59 plus VRBO fees. Regular rate is $250/nt +. Note: VRBO.com only displays the highest rates for a min. stay of 5 or 6 nights. Other rates for shorter stays will be updated manually in the system once a request is made. Very clean, spacious condo with two bedrooms, two bathrooms on sixth floor of The Ilikai. Sleeps six comfortably. 2 swimming pools on the property. Steps away from the beach and swimming lagoon, next to Hilton Hawaiian Village and two blocks from Ala Moana Shopping Center (groceries, cleaners, dept. stores, restaurants). City/Mountain view. -Sleeps six comfortably. Two king-size beds (one may be split into two twins) and a sofa bed. Note: bedroom shown in photo has full divider/door. -Full kitchen: Elec. stove, microwave, oven, fridge/freezer w/icemaker, garbage disposal, dishwasher, dishes and kitchenware. -One bath has tub + shower, one bath has shower. -Two TVs including 32 inch flat screen TV and DVD player. -Ultra quiet state of the art air conditioning. -Free WiFi in the unit and lobby. -Linens, towels, toilet paper and bath soap. -Restaurant in lobby and plenty of restaurants within 1 block including 24 hour coffee shop. -Friday evening fireworks display and free Hula show on Friday and Sunday nights. -Parking available in paid lot ($28/24 hours). 10% DISCOUNT FOR 2 WEEK RENTALS. 10% KAMA'AINA AND MILITARY DISCOUNT EXCEPT FOR CERTAIN PEAK PERIODS OR DEEPLY DISCOUNT SPECIALS. This property is in compliance with all State of Hawaii regulations. Hawaii Tax I.D. #W60371420-02. Owner/resident manager: Joan Cote. The Ilikai is a landmark in Waikiki...famous for being the site of the Hawaii Five-O opening scenes! It is a great location...close enough to the heart of Waikiki and all it's activity but easy access to other areas of Honolu since it is on the edge of of Waikiki....we like this convenience. Plus its only a 3 min walk to the famous Ala Moana Shopping Center which offers not only shopping but restaurants and entertainment as well. Best of all it is practically ON the beach...just walk onto the Pacific Terrace and down the scenic walkway toward the swimming lagoon and on the other side of the lagoon is Waikiki Beach. No streets to cross and just a 2 min. stroll. The swimming lagoon is an added bonus with water sports offered too. Perfect for families with young children. 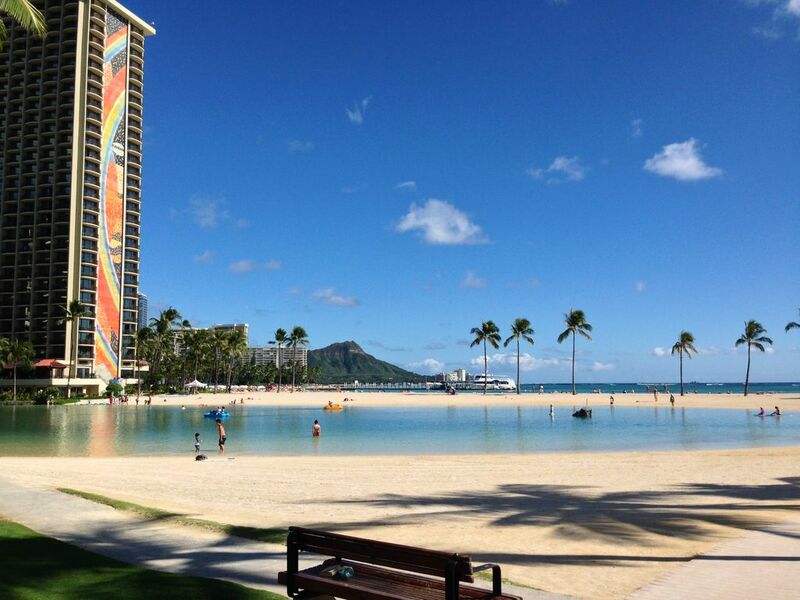 A short walk around the lagoon to the famous Waikiki Beach. Coin-op Washer/Dryer on same floor. Valet or self parking is available at $28 per 24 hour period. Most guest do not use rental cars as the area offers many conveniences within walking distance. Dishes, glasses, silverware, coffee cups. Kitchen utensils. Pots & pans. Large flat screen TV and DVD player. A few videos are availalbe for your use. Some Boogie Boards, beach chairs, etc. We feel very blessed to have had the opportunity to stay in the condo. It was spacious, clean and in an ideal location. Christy was the perfect hostess - informative, accommodating and gracious. We look forward to returning to Hawaii again in the future and would definitely try to stay in the same place. The location of the Ilikai was perfect as well as our stay in condo #625. It was a corner unit so it had 2 beautiful balconies. Very clean, could use a new twin bed, but overall very nice. Enjoyed our stay, in the middle of everything we needed. Excellent location and the condo was supplied with everything we needed. Would definitely stay there again. We stayed here for 13 nights. Unit was very clean and well furnished. Enjoyed sitting out on the lanai watching the street activity. Timely, easy communication with owner. Valet parking worked well for us. $28/day with in/out privileges. Pleasant, efficient service. We'd stay here again when returning to Waikiki. Communication with booking agent was prompt and very helpful. Apartment had everything we needed. Waikiki (a part of the City of Honolulu most popular with the tourists) is full of restaurants, shops, and activities of all kinds. It is one of the most inviting beaches in the world offering sunshine almost 365 days a year! 10% military and Kamaaina Discounts apply except for Holiday Rates. 10% discount for 2 wk rental or 20% disc for 3 wk rental except for Holiday Rates. 10% discount for returning guests. 50% discount on daily rate for early check-ins (before 11am) or late check-outs (after 2pm).